Marquette, Mich.—Northern Michigan University Olympic Training Site wrestlers defeated the All-Navy team 14 matches to three tonight in a freestyle and Greco-Roman dual meet. 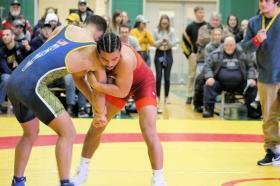 The NMU-OTS squad earned nine wins by technical fall, four by pin and one match going the full two rounds. Although the NMU-OTS athletes train exclusively in the Greco-Roman style, team members also competed in freestyle matches to allow the All-Navy team to prepare for upcoming events where they will compete in that style. The NMU-OTS team took the win in the freestyle portion of the competition with a team score of eight matches to one. The Greco-Roman portion of the evening showed the NMU squad’s experience at that discipline with all six of their wins coming by technical fall. The All-Navy team is in Marquette until February 20 preparing for the Armed Forces Wrestling Championships February 21-25 held on the U.S. Army’s Fort Bliss Base in Texas.